Ideal for industrial use! 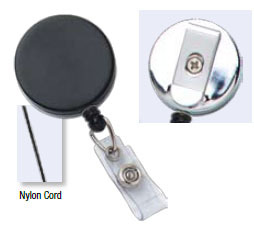 The Heavy Duty Badge Reel is used for carrying more items then just an ID badge. Some people use it for carrying keys or a cell phone. They have a heavy exterior made of metal and plastic, where the economic reels are 100% made from a plastic material. The spring inside is a heavier spring to carry or hold heavier items. 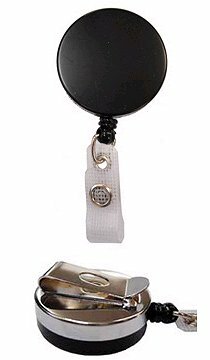 The Heavy Duty BadgeBack is constructed of durable Delrin plastic face with chromed metal back and belt clip. The clear vinyl strap will accommodate any slot-punched ID card. - Wire material: Selectable from nylon, steel wire or chain.